Anyway, that leaves little time for out-of-the-box cooking stuff, so my most novel achievement recently is …homemade popcorn. No, really. I’ve avoided the in-a-bag microwaved stuff for years, ever since one of my college roommates introduced me to the wonders of the for-real popcorn she used to make in one of the contraptions pictured at right. I don’t have one of those and I don’t like burning stuff, or setting stuff on fire, or burning me, or creating difficult-to-remove residues on the bottoms of other people’s cookware. So I’ve been avoiding attempting it. Newsflash: homemade popcorn is obscenely easy (and generally a lot better for you than the microwaved junk). Seasoning: I usually use 1/2 c Parmesan cheese, a pinch of Cayenne (red) pepper, & 1-2 tsp Italian seasoning (see below for other flavorings). I don’t add salt since the cheese has some saltiness to it. In a small bowl, mix the Parm & seasoning; set aside near your stovetop. Heat the oil in the pot (unlidded) over high heat with one kernel in the oil. When the kernel pops, add in the rest of the corn, lid the pot, and using the FOLDED potholders to hold it, either (a) scoot it back and forth on the burners over medium-high heat (see video embedded below), or (b) hold the pot as close above the burner as you can get it (burner on high) and use a circular motion to toss the popcorn inside the pot as though you were a pro chef sautéeing veggies super-fast. Stop once or twice to open and check on it (and to release the steam – open the lid AWAY from you to avoid escaping steam and/or manic corn). Keep going until the popping slows down, maybe 4 minutes. Once you’ve popped almost all of the kernels and some of the middles are toast-colored, turn off the heat under the pot and dump the popped corn into a large-size bowl. Use a clean dishrag or paper towel to get the remainder bits out. Put the pot back onto the (turned-off) burner, dump in the butter to melt it, then pour the butter into the cheese-spices mix. Mix fast, pour over popcorn, and toss. Consume. 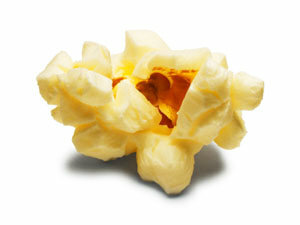 Use old, dehydrated kernels that have wrinkles in them: these won’t pop. Reconstitute them by filling a lidded 1-quart jar 3/4 full of the old popcorn, adding 1 Tbsp of water, and shaking the thing every so often over 3 or 4 days, until the water re-absorbs. Fruity popcorn balls (not vegetarian): instead, combine 1/2 c butter, 1/4 c sugar, 3 Tbsp water 1 Tbsp corn syrup, and 1 (3oz) package fruit gelatin mix. Bring to a boil and boil 3-4 min until a dop of hot mixture in a cup of cold water forms a rigid ball. Toss with cooked popcorn, spread on a greased baking sheet and bake at 300°F / 150°C 5 min. Stir, bake 5 more min, then let it cool and either form it into balls or break it into clusters.